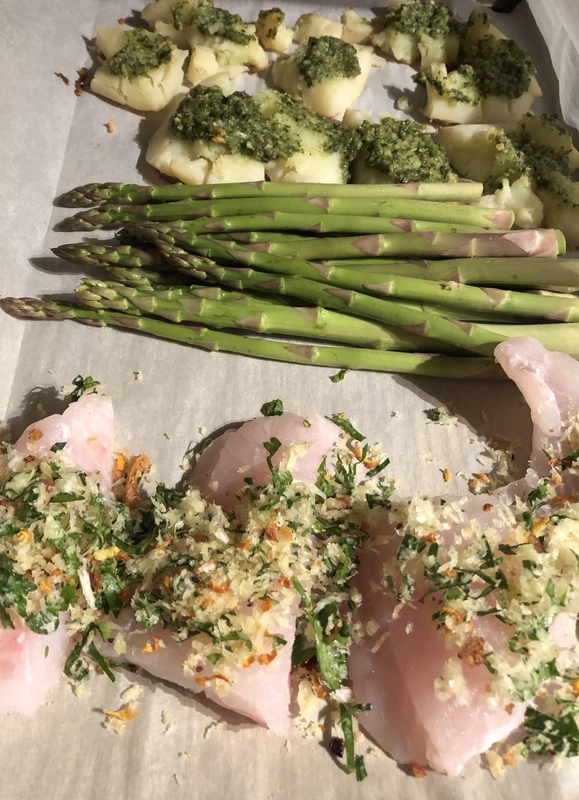 Parmesan Cabrilla, Pesto Crashed Potatoes and Asparagus, One Pan Dinner – What's for dinner, Doc? CSA's, Fresh Fish, Healthy Eating, La Gringa's Kitchen, Recipes, What's in the box? Cabrilla is a type of grouper found in the Sea of Cortez, Baja. The large flake white flesh is on the firm side with a mild taste. I think it’s similar to Alaskan cod or halibut. We paid approximately $7 a pound which is expensive for fish here. I couldn’t find a lemon for lemon zest so I used dehydrated lemon zest that I dried in January. I usually use fresh parsley for this fish topping but I didn’t have any so I finely chopped lovage leaves, which taste like celery leaves. The asparagus and basil were from my CSA box. Prepare pesto: Combine a generous handful of fresh basil leaves, 1/4 grated Parmesan cheese, 1/4 cup olive oil, 2 cloves of garlic, 1/4 cup pine nuts or walnuts, and 1/4 teaspoon of salt. Whirl in a food processor or grind with a mortar and pestle until desired consistency. Set aside. Prepare potatoes: Boil whole small yellow potatoes in salted water until tender; 20 minutes. 1-2 per person. Cut potato in half and place cut side down on a sheet pan lined with parchment. Smash them with a potato masher or a flat bottom glass. Gentle turn potatoes with their cut and smashed surface up. 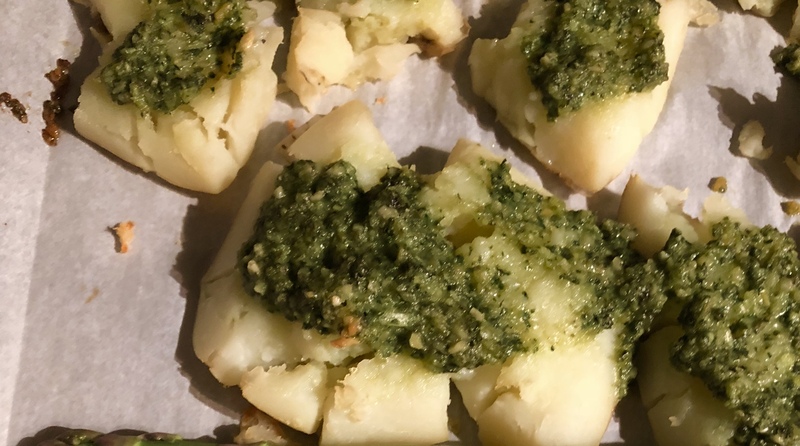 Add a tablespoon of prepared pesto to each potato. Preheat oven to 400 F. Bake potatoes on parchment lined sheet pan for 15 minutes. While potatoes are baking prepare fish and wash asparagus. Lightly salt fish. 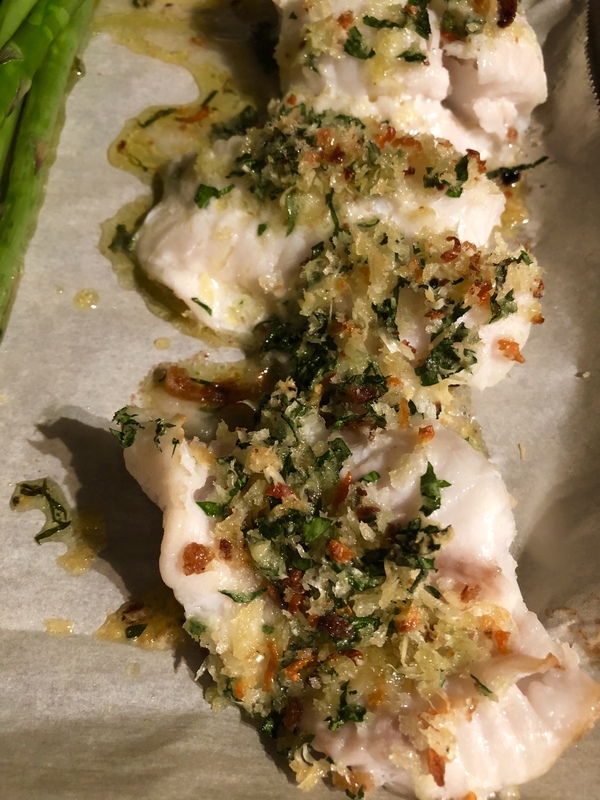 Combine 1/4 cup grated Parmesan cheese, 1/4 cup panko bread crumbs, 1 tablespoon of lemon zest and 2 tablespoons of finely chopped parsley or lovage leaves, 2 tablespoons of olive oil and 1/4 teaspoon of ground black pepper. Place 2 tablespoons of cheese mixture over fish. Remove sheet pan with potatoes from the oven and arrange fish on the opposite side of the partially baked potatoes. Place asparagus, with a drizzle of olive oil, between the fish and potatoes. Return the sheet pan to the oven and bake an additional 18 minutes. My fish filets were approximately 1” thick, adjust the cooking time accordingly but don’t over cook. The fish is done when it flakes, is opaque and has a slight sheen when cut. This topping would be delicious on any fish. I’ve used it with petrale sole and salmon. You could substitute any fresh herb for the parsley including thyme or oregano. Crashed potatoes are great with plain olive oil, bacon bits, or chorizo. I hope you try this easy one pan dinner. You might like my Baja Mexican Fish Recipe Pinterest Board. This looks and sounds absolutely fantabulous! Me too. They’re crispy and delicious. Happy thanksgiving Tracey! You’ve inspired me on the dehydrated lemon zest! Sounds like the perfect flavour enhancer for when I’m low on lemons! Lemons are not common at the markets in Loreto, Mexico. Key limes and Persian limes are abundant but people in my village will let lemons rot on the trees. So in December I will begin collecting them. I freeze the juice in cubes for drinks or sauces, I zest the ones that I juice. I wash and freeze whole lemons when I’m tired of processing them. I’m very popular with the lemon loving expats in January and February. 😂😂 Thnaks for stopping by mi casa.